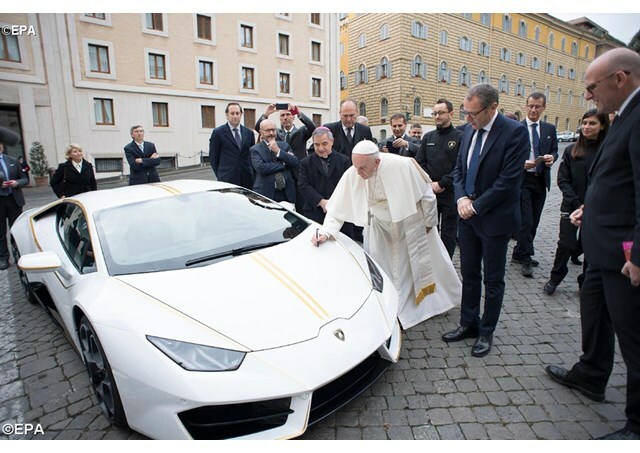 (Vatican Radio) Pope Francis was presented with the keys to a brand-new Lamborghini Huracan on Wednesday by officials from the luxury car maker. The special edition car, however, will be auctioned off by Sotheby's in London and the proceeds given to four charities in Pope Francis' name. Pope Francis blessed the car and signed the hood after receiving it in front of his Casa Santa Marta residence. Sporting the papal colors - white with yellow-gold detailing - the Lamborghini Huracan's base price usually start at 183,000 euros but the specially-made papal car should bring far more at auction. A statement from the Holy See Press Office said some of the proceeds will go to the papal charity "Aid to the Church in Need" towards rebuilding homes, churches, and public buildings in Iraq's Nineveh Plains. These funds, the statement said, will help Christians who had taken refuge in Iraqi Kurdistan "to finally return to their roots and recover their dignity." Another recipient of the Lamborghini's proceeds is the "John XXIII Community", which offers protection and aid for women who have been victims of human trafficking and prostitution. Two Italian charities which work mostly in Africa - Gicam and Friends of Central Africa - will also receive some of the funds to support projects dedicated to providing medical care for women and children.